The fundamental norms and core tenets of international humanitarian law and multilateral disarmament are not in crisis. Rather the real challenge is to ensure their effective implementation and application. In undertaking a health check on the rules-based global order as it relates to disarmament and to international humanitarian law, it is necessary to unpack what is now a complex, sprawling, loosely interlocking ecosystem. I have taken the liberty of addressing international humanitarian law in parallel with disarmament because the substantive and institutional development of these two fields of endeavour has been closely inter-related. Australia has a long and proud history of productive engagement in the evolution of both international humanitarian law and multilateral disarmament. The overall effectiveness of multilateral outcomes on disarmament and international humanitarian law is conditioned by the degree of constructive engagement of all participants. Notably, implementation of and compliance with treaty and other relevant obligations are primarily a function of the political will of UN member states. It is too often forgotten that binding international legal obligations under treaties are voluntarily undertaken by ratifying or acceding states. The international community is watching with keen interest what might follow from the historic 12 June summit in Singapore. If real momentum develops on North Korean denuclearisation, a strong and independent verification regime would be required. The International Atomic Energy Agency and other relevant multilateral mechanisms would have a major role to play, providing a huge opportunity and challenge. The Security Council’s inaction in the face of use of chemical weapons in Syria and other flagrant abuses of international law such as shelling of civilian apartment buildings is often cited by those arguing that the rules-based global order is crumbling. Another example is extreme terrorist violence and other atrocities committed by non-state actors such as Islamic State which seem to make a point of thumbing their noses at international humanitarian law. Such events have raised fatalistic voices of those who despair that previously-accepted norms are now a dead letter in many parts of the world, by virtue both of the attitudes of the transgressors and the lack of effective enforcement of compliance. I would argue, however, that fundamental norms such as the unacceptability of nuclear weapons proliferation, the prohibition of use of conventional weapons and the core tenets of international humanitarian law — humanity, necessity, proportionality and distinction — are not in themselves in crisis. Rather the real challenge is to ensure their effective implementation and application, including in evolving armed conflict scenarios such as in cyberspace. International humanitarian law compliance is a more complicated story. On the one hand, the brutality of conflicts in places like Syria, Iraq and Yemen and acts of terrorism across the globe are cause for pessimism. On the other, they have certainly raised international awareness of international humanitarian law and fundamental humanitarian principles, albeit through a fuzzy lens. There is scope to build on this, both on the part of governments and perhaps even more importantly with regard to civil society. The international community is also now much more focused on accountability and bringing an end to impunity, especially for grave breaches of international humanitarian and human rights law, including through the Human Rights Council and its related processes. It is hard to see the complex web of multilateral disarmament treaties established since the landmark Non-Proliferation Treaty being successfully renegotiated if it were to be dismantled. Similarly, revisiting the Geneva Conventions in current circumstances could well take us backwards. A major current challenge for Australia, and its like-minded partners from all regions of the world, is thus to resist precipitate erosion or even demolition of arrangements and institutions that have generally served us well. At the same time, “business as usual” is just not going to cut it over the coming decade. 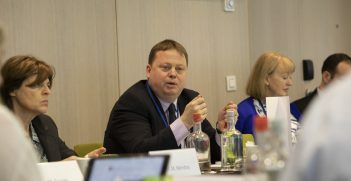 In particular, the multilateral system must inter alia become more responsive to member states’ national security and humanitarian concerns, including in relation to impunity; it must reflect better the new multipolar global strategic order, streamline its process-heavy meetings to facilitate real dialogue and practical problem solving, give more attention to prevention and better reflect multi-stakeholder realities. Change and adjustment to the multilateral ecosystem of disarmament and international humanitarian law tend to be gradual. Everything has to be negotiated, usually through to a consensus. Considerable vested interests are also in play. These two dynamics lead to an inherent conservatism which can be helpful in protecting valuable multilateral processes built up over decades. At the same time, such conservatism generates resistance that slows sensible and necessary reforms. It also means that significant diplomatic investments are usually required to achieve meaningful change. It is arguable that we have now reached a stage where the well-entrenched multilateral instinct of rushing to negotiate new binding international instruments is no longer appropriate. The UN could be more useful as a clearing house for exchange on implementation of existing norms, including sharing experience with obstacles and challenges to compliance, as well as success stories. Not surprisingly, most commentary focuses on specific, high profile disarmament initiatives. However, the prosaic reality is that the main day-to-day action in these fields, including in relation to international oversight and assistance with implementation of relevant treaties, lies within a complex network of multilateral meetings, secretariats, reports and other processes. While much useful progress continues to be achieved in conventional disarmament, refreshing the narrative in this field would help highlight its interconnections and links with other important international agendas. The Arms Trade Treaty, which embeds international humanitarian law principles, is a good illustration. Another current and ongoing challenge is the failure of states parties to pay their dues under the relevant treaties, which for most countries involve relatively modest amounts. Funding shortfalls have resulted in the threatened cancellation and truncation of recent meetings, such as the important annual conferences of states parties to the Mine Ban Treaty and the Convention on Certain Conventional Weapons. Australia, led by the Department of Foreign Affairs and Trade with support from Defence and other agencies such as Attorney-General’s Department, has maintained a significant diplomatic investment in multilateral disarmament. At the same time, available resources have been shrinking as other priorities have loomed larger for Australia in the current century, notably counter-terrorism, irregular maritime arrivals and, more recently, cyber. The same could be said of many of our like-minded partners. 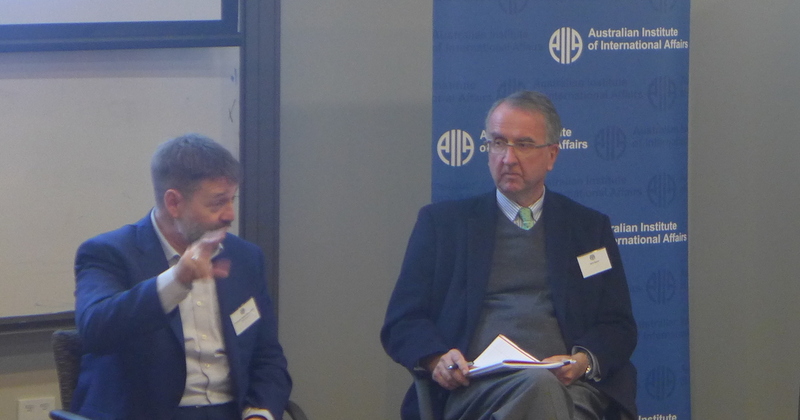 While Australian delegations have continued to be creative, its disarmament engagement has necessarily been oriented more towards “care and maintenance” than new initiatives. 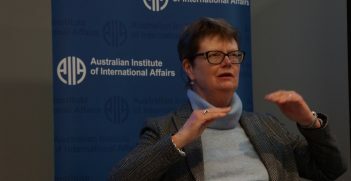 However, given current pressures on the established multilateral architecture, there are expectations that Australia could be doing more to contribute new thinking on the way forward. One proposal worthy of further consideration would be to appoint a dedicated, Canberra-based Arms Control, Non-Proliferation and Disarmament Ambassador who could attend relevant international meetings in Geneva, New York, Vienna and other locations, while spearheading inter-agency and outreach work in Australia. This would mirror arrangements in place for counter-terrorism and now cyberspace, and would send a strong signal of continuing strong Australian commitment to these longstanding agendas. 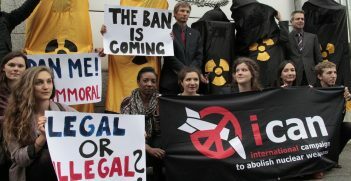 An extensive framework of legal and political commitments and supporting institutional arrangements has developed around the closely interconnected tracks of international humanitarian and disarmament. This framework has proved resilient and adaptable over the decades. It has served us relatively well and will continue to do so. A good illustration is the central relevance of international humanitarian law to developing the international “rules of the road” in relation to cyberspace, outer space and new weapons technologies such as lethal autonomous weapons. Australians have been active, constructive and creative contributors to these arrangements which now more than ever need our strong but not uncritical support, along with an injection of creative thinking. In this endeavour, governments, including Australia, will need inspired input from wider civil society. John Quinn is the former Australian diplomat who served as Ambassador and Permanent Representative to the United Nations and to the Conference on Disarmament, Geneva. These are his personal views, and not those of the Australian Government. This article is an edited extract of his presentation titled “IHL and Disarmament” presented at a conference on Australia and the Rules-Based International Order held on 18-19 July organised by the Australian Institute of International Affairs, Department of Foreign Affairs and Trade and ANU Coral Bell School with the support of the Attorney-General’s Department. As one of the key maritime nations in the southern hemisphere and a prominent middle power, Australia has an important role to play in the global ocean governance framework. Earlier this week, the 2017 Nobel Peace Prize was awarded to the International Campaign to Abolish Nuclear Weapons, which began in Australia.